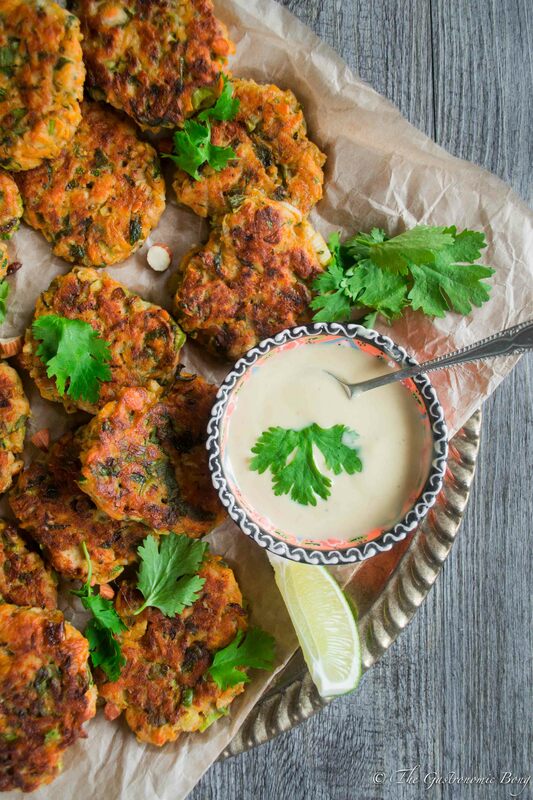 Gluten-Free Zucchini Sweet Potatoes and Chicken Fritters is made with chickpea flour/ gram flour is super delicious, slightly crispy and herby and is perfect with this Honey-Mustard Yogurt Dip. Perfect for sharing!! It’s fun to get together and have something good to eat at least once a day. That’s what human life is all about — enjoying things. The truth is, my heart always desires fritters or pakodas. Specially when they are so healthy and flavourful. Zucchini is one of my favourite veggie and this is one of my favourite ways to use zucchini! 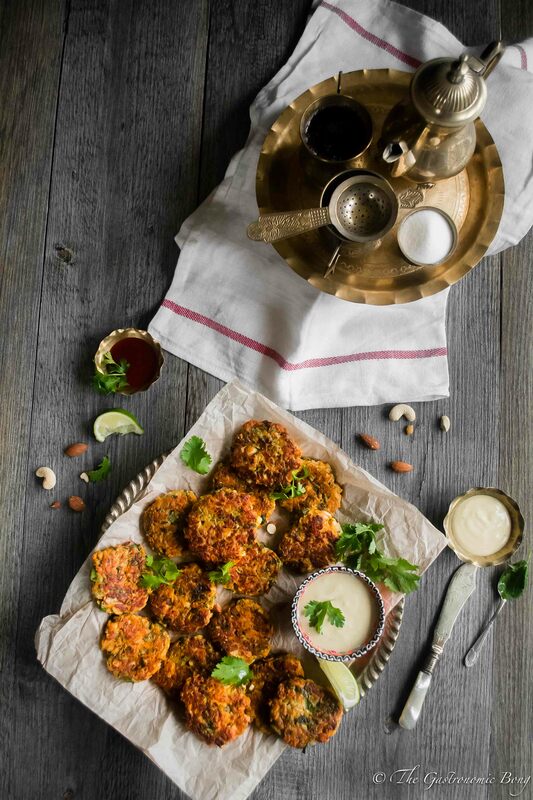 Here is another delicious Gluten-Free Zucchini, Corn and Cabbage Fritters which I served with Sweet chilli mayo and Minty Yogurt Dip.. which I absolutely adore and make it quite often..
Golden brown, crispy and light Zucchini, Sweet Potatoes and Chicken Fritters is a clever way to sneak in super veggies and proteins in your diet. Specially for kids or someone who doesn’t like too much veggies. These chicken, zucchini and sweet potatoes fritters are light and delicate. 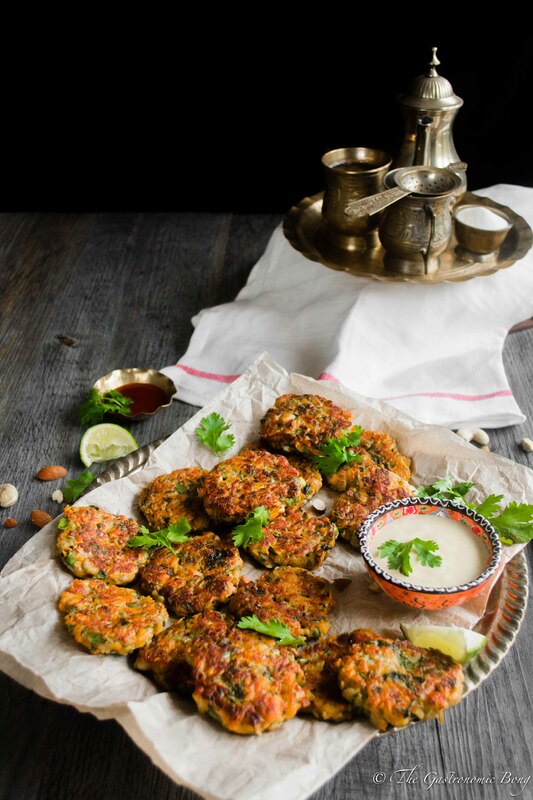 To make these fritters more interesting I have added in chopped almonds and cashew nuts, to get that extra crunch. These nuts really does give a nice and crunchy texture to it. It is not only delicious but also unbelievably easy to make and can be whipped up in a jiffy. Grated sweet potatoes, grated zucchini, finely chopped chicken, spring onions, chopped nuts, chopped chillies, coriander leaves, ginger-garlic paste along with some paprika, cumin powder, garam masala powder, salt and amchur powder (dried mango powder) or 1 tbsp lemon juice. Everything is mixed together well with these Gluten free flour like Chickpea flour (gram flour) and rice flour. Rice flour gives a nice crispness to these fritters. Then these mixture is shallow fried (just like pancakes) in very little olive oil for about 5-6 minutes on each side. Voila!! 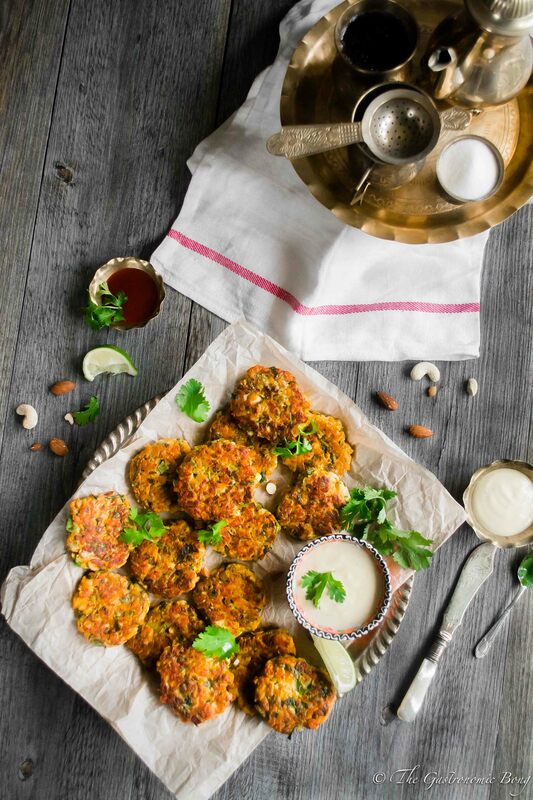 This gluten free and guilt free Zucchini, Sweet potatoes and Chicken fritters is made with chickpea flour/ gram flour is super delicious, slightly crispy and herby and is perfect with this Honey-Mustard Yogurt Dip. Perfect for sharing!! Grate the zucchini and place into a colander. Squeeze out all the moisture from the zucchini with your hands and place the zucchini into a large bowl. Add the rest of the ingredients except the oil into a bowl and mix well and let the batter sit for 5-10 mins. Drop a spoonful of batter onto the hot skillet and flatten it slightly. Cook 5-6 minutes on each side or until golden brown. Place the fritters onto a plate lined with a paper towel and then continue with the rest of the batter. Meanwhile to prepare the dipping sauce, in a small bowl add yogurt, honey, lime juice, mustard, salt and pepper and mix everything well. Serve these hot Zucchini Sweet Potatoes and Chicken Fritters With creamy Honey-Mustard Yogurt Dipping sauce. Have a Great Week and a Fabulous Weekend Ahead!! I love the colour of these, and a great way to get some extra veggies in your diet too. 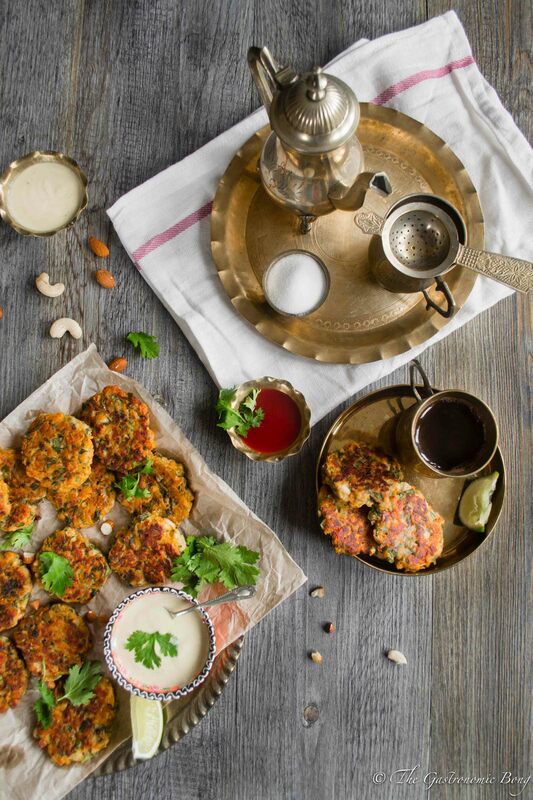 These fritters look amazing, Arpita! I’ve always wanted to try something like this, so now I think I have the perfect recipe! Love the honey mustard sauce too! Gahh! Golden brown delicious fritters make my heart go pitter-patter! And these look AMAZING! LOVE the combination of zucchini, sweet potatoes and chicken in these! Plus that honey mustard yogurt dip? OMG. GIMME GIMME! I could nosh on these all day! YUMMMMM! Cheers, girlfriend! Arpita these are so beautiful!! Your pictures and tablescapes just draw me in! I bet this would taste just as great without the chicken right? Either way I am going to attempt a vegan version of these! Thank you so much Kushi!! Zucchini is definitely my favorite veggie too, it’s so versatile. 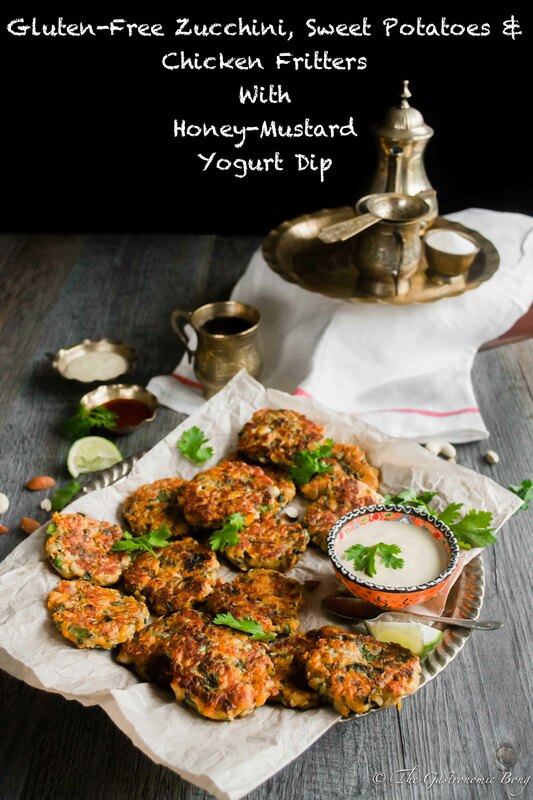 I’m loving these fritters and that honey mustard yogurt dip sounds like a perfect addition! These look yummy! Love the combination and the sauce is perfect, too! These fritters look amazing, Artpita! Love the zucchini and sweet potato combo and that honey mustard yogurt dip sounds like the perfect compliment! These fritters look magically delicious! As always, your photos are stunning and I love the styling. wow these look amazing, so full all flavor, crunchy and that dipping sauce sounds so good. Pinning! OMG! Yes! This is just too good! I love this recipe! Thank you so much for sharing! Mmmm wonderful flavors! The dip sounds so good Arpita!! 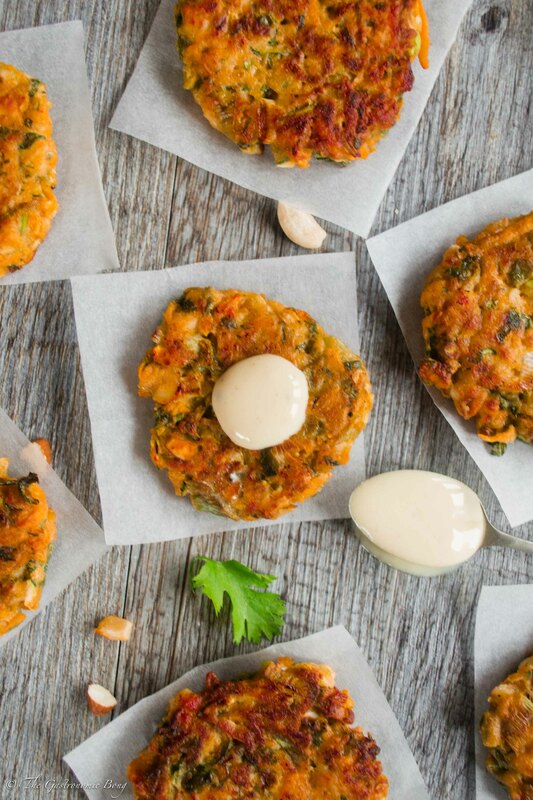 I am not a fan of meat in fritters but these look delicious with or without the chicken! This is one great way to perk up your mood on a rainy day! I love fritters, sweet potatoes, zucchini, and that dip — it all sounds so perfect. 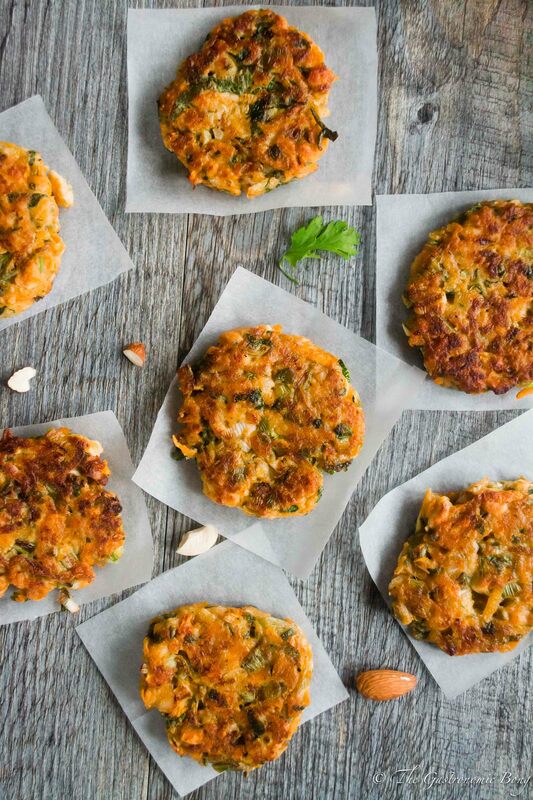 My kids won’t ever object to veggies when they’re in a delicious fritter — these would be a big hit! I am a fritter girl! And these look to die for! Loving all the flavors and the crunch from frying. Have I told you how much I enjoy reading your quotes? I always look forward to seeing what you’ve chosen!